The National Film and Television School (NFTS) is a film school established in 1971 and based at Beaconsfield Studios in Beaconsfield, Buckinghamshire. It was at number 1 in the 2014 Hollywood Reporter top 15 International film schools. Its community of students makes around a hundred films a year on courses that are over 90% practical and unlike courses offered at other UK film schools. As of 2013 it had around 220 full-time students, with a further two dozen part-timers on the Script Development course and about a thousand a year on its short courses. Beaconsfield Studios comprises film and television stages, animation and production design studios, edit suites, sound post-production facilities, a music recording studio and a dubbing theatre, all furnished with current digital equipment comparable to that used in the film and television industry. It is the only film school in the UK with its own film and television studios. The BBC stated that the NFTS was the "leading centre of excellence for education in film and television programme making", and noted that it was "relevant to the industry's present and future needs." British Film Magazine once described the NFTS as being one of the few schools to come "very, very close" to guaranteeing a job in the film industry, and named its leader (Powell) a "maverick"; Filmmaking.net named it one of two films schools outside the US which had such a high international reputation. In 2013 the National Film and Television School became the first film school in history to win all three of CILECT's (the main international film and TV school association that includes 160 schools from 60 countries) competition categories (the winners were "Head Over Heels" in Animation, "After" in Documentary, and "The Mass of Men" in Fiction). The National Film School opened in 1971, the work of four years of planning to create an institution to train personnel for the British film industry. Department of Education and Science had in 1967 recommended the creation of a national film school for the UK, and in 1969 an inquiry led by Lord Lloyd of Hampstead began to develop plans. In 1970 a Scot named Colin Young, then chairing the UCLA's Department of Theater Arts, was appointed as the School's first director. The NFS bought the old Beaconsfield Film Studios in Buckinghamshire and set about refitting it to professional industry standards. Young established four permanent departments—production, camera, editing and sound—and in 1971 accepted the first intake of 25 students. The curriculum in the early days was loosely structured; sporadic seminars and workshops were secondary to production, with students spending most of their time doing what they had come to the School to do—making films. But by the early 1980s, Young felt this system no longer served the students' best interests and a more structured curriculum was introduced. Links with the industry were strengthened to supply collaborative, financial and production expertise. In 1982 the School changed its name to The National Film and Television School, and launched a pilot project for re-training freelance industry professionals. This led to the establishment of the National Short Course Training Programme (now ShortCourses@NFTS), which has been running courses ever since on all areas of film and television production. By the early 1990s the school had modified its original stance on course structure, deciding to provide specialisation at the time of entry. The first year still offered a general course, followed in the next two years by focused training in one of the ten specialist areas (direction, writing, editing, camera, sound, animation, design, producing, documentary and composing). Colin Young retired in 1992 and was succeeded by Henning Camre, formerly Head of the National Film School of Denmark. Camre aimed for more balanced numbers in each of the ten specialist areas, creating separate departments with their own head tutors and curricula. He secured a Lottery grant to install state-of-the-art equipment, supporting new production methods offered by innovations in technology and ensuring that graduates were trained on up-to-date equipment. Camre was succeeded in 1998 by Stephen Bayly, an NFTS graduate and film producer (Richard III, Mrs Dalloway). His first move was to reorganise the curriculum to run over two years, instead of three. Recognising a growing trend towards a requirement for academic qualifications, he sought to achieve this. Eventually, The Royal College of Art agreed to validate the School's courses and 2000 saw the first intake of students who would graduate with an MA. In 2002, Bayly introduced the first of the shorter Diploma courses, established to meet an urgent Industry need for properly trained sound recordists. September 2003 saw Nik Powell, one of the UK's leading producers, to take over from Bayly. Powell has rapidly expanded the programme of new courses, introducing Diplomas in Producing & Directing Television Entertainment (now an MA), Digital Post-Production, SFX/VFX, Directing Fiction, and Script Development (a partnership venture with The Script Factory). Powell has reinvigorated the programme of visiting filmmakers, and set up a programme of masterclasses run at London cinemas for NFTS students and the public. He has also introduced a range of development deals with broadcasters and independent production companies to help new NFTS graduates get started and, in 2005, joined forces with NESTA (The National Endowment for Science, Technology and the Arts) to launch NFTS Inc, a Creative Pioneer programme supporting graduates of any UK film school develop start-up businesses in the motion picture industry. The NFTS holds yearly graduation shows at the BFI Southbank (formerly known as the National Film Theatre). These are highly selective and invite-only events which showcase the student's projects to scouts and industry professionals, ensuring that the students receive maximum exposure. The NFTS is a Creative Skillset Film Academy. 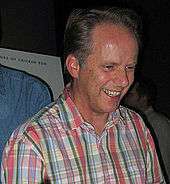 Alumnus Nick Park has gone on to win four Oscars. Alumni of the National Film and Television School have gone on to win Oscars, BAFTAs and Emmys as well as film festival prizes from around the world. In the last 7 years student films (Badgered (2005), The Confession (2011), Head Over Heels (2013)) have gone on to be nominated for 3 Oscars, and the graduation film 'Edmond' won the 2016 BAFTA for Best Short Animation, the third year in a row an NFTS animation has won the category. In 2013 the NFTS graduation film "Miss Todd" won the Student Academy Award for Best Foreign Film presented by Academy of Motion Picture Arts and Sciences. This marked the sixth time the NFTS had won in this category, more than any other Film School outside of the United States. Later in 2013, NFTS students won the prize in all of CILECT's (the main international film and TV school association that includes 160 schools from 60 countries) 3 competition categories (the winners were "Head Over Heels" in Animation, "After" in Documentary, and "The Mass of Men" in Fiction) – and each time by large vote margins. NFTS was the first school in the 58-year history of CILECT to achieve the clean sweep of all 3 prize categories. The school's facilities were expanded in 2008 with the addition of new teaching spaces, public spaces and a new cinema, designed by Glenn Howells Architects and Buro Happold. Upon its completion in 2008, the strikingly modern three storey building (see photo above) won a coveted RIBA prize. 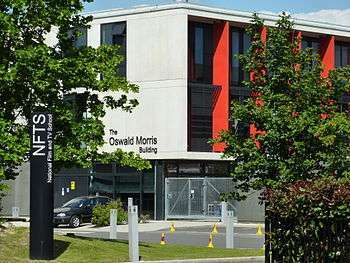 In June 2009 it was formally named The Oswald Morris Building in honour of veteran cinematographer Ossie Morris. Until its repeal in 1986, the school was funded partly through a tax on cinema ticket sales known as the Eady Levy, named after then UK Treasury official Sir Wilfred Eady. The NFTS has since been funded by the UK Government, via (today) the Department for Culture, Media and Sport, and the television and film industries. Key Partner Sponsors include main UK terrestrial and satellite broadcasting companies BBC, Channel 4, BSkyB, S4C and the Film Distributors' Association. In addition, a large number of public and private donors fund scholarships to assist (chiefly British and EU) students. The school has around 70 full-time staff as well as many top tutors from within the industry. The National Film and Television School has awarded over 20 fellowships since 1981 with ceremonies taking place at their graduation ceremony each year. The NFTS Fellowship is awarded in recognition of outstanding contribution to the British film and television industry. ↑ "Hollywood Reporter". Hollywood Reporter. 2014-07-30. Retrieved 2014-09-11. ↑ "BBC.co.uk". BBC.co.uk. Retrieved 2013-09-12. ↑ "Filmmaking.net". Filmmaking.net. Retrieved 2013-09-12. 1 2 Leo Barraclough (2013-08-25). "U.K.'s NFTS Rules at Int'l Film School Awards". Variety. Retrieved 2013-09-12. 1 2 Dalya Alberge. "British film school voted world's best as it scoops student 'Oscars' | Film | The Observer". Theguardian.com. Retrieved 2013-09-12. ↑ "BBC 2007 Graduation Show Article". Bbc.co.uk. 1970-01-01. Retrieved 2013-09-12. ↑ "NFTS awards and nominations". Nfts.co.uk. Retrieved 2013-09-12. ↑ "RIBA Awards 2008". RIBA.org. Retrieved 2 May 2011. ↑ "Honorary Fellows". National Film and Television School. Retrieved 24 February 2016.